DALLAS ― Rachel Nash is a licensed professional counselor. She works with a diverse group of clients, including children, adults and the elderly. She talks with them. She builds relationships with them. She guides them through discerning their own complex emotions. In these ways, she is similar to other counselors. What separates Nash from her colleagues are the art supplies that accompany her in every therapy session. Nash is an art therapist. Art therapy is a well-established but sometimes overlooked way of getting help with issues, and it’s especially helpful for those who don’t express themselves well through words. It can be difficult to find in the Dallas area, Nash says, because of an absence of universities that offer the programs. “There’s such a need for art therapy here,” she says. Other art therapists agree. “To become an art therapist, you have to be trained elsewhere,” says Andrea Davis, president of the North Texas Art Therapy Association. This means leaving Texas ― and probably not coming back. After getting a master’s in art therapy from the School of the Art Institute of Chicago, she was offered a job as an art therapist in Chicago but turned it down to return home. “I thought it would be kind of fun to bring art therapy here,” she says. She worked for four years at the Art Station, an art therapy nonprofit in Fort Worth, before venturing out on her own to start Rachel Nash Art Therapy. She is in the process of finding a new location after unexpectedly losing her lease in a Dallas neighborhood in September. “I think everybody can benefit from art therapy,” says Nash. Both she and her former coworkers at the Art Station work with clients of all ages who seek therapy for everything from serious addictions to anger management to low self-esteem issues to merely exploring options for personal growth. People who have difficulty communicating find art therapy especially beneficial, Nash says. That’s because art therapy allows individuals to express their emotions through images rather than words. Say a kid starts flinging clay at the table. “You’re helping them identify feeling words with actions,” Nash explains. Jane Avila, founder of the Art Station, found this to be particularly true when she lost her son to suicide more than a decade ago. 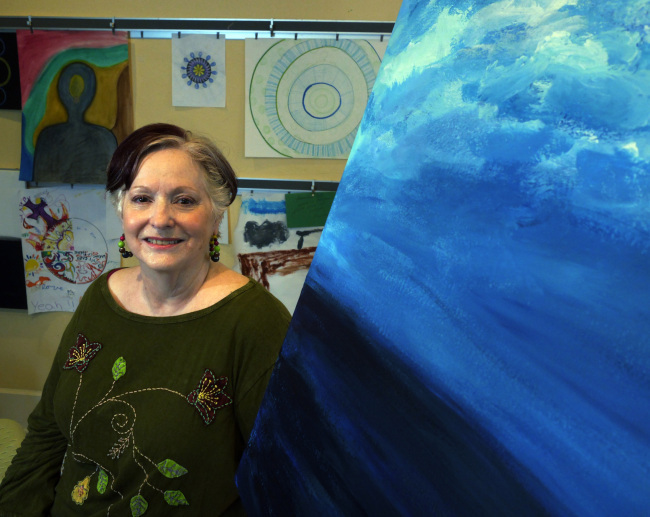 Avila tried talk therapy, family therapy and a variety of grief support systems to assuage her pain, but it wasn’t until starting art therapy that she felt she was beginning to heal. “It saved my life,” Avila says. How? Avila, a licensed clinical social worker, points to the neurology of the brain. The frontal lobe is what Avila calls the executive center. It’s where we process language and explain our own behaviors and what happens to us. When trauma occurs, the frontal lobe often shuts down because it can’t rationalize why something bad is happening, she says. This causes verbal processing to be exceptionally difficult. Art therapy allowed Avila to process her emotions without having to use the frontal lobe to come up with words that explained her loss. As part of her therapy, Avila drew a series of mandalas, or drawings of circles containing images that expressed how she was feeling at the time. After several years, Avila laid all of her mandalas out before her. She was surprised to discover that she’d unknowingly drawn several images over and over again. One image in particular struck Avila: a red dragon. Avila recognized it immediately as a symbol for her rage. “If you’re a really good little girl, then nice things happen to you,” Avila used to think, but her son’s suicide obliterated that way of thinking. Avila was angry that she couldn’t prevent her son’s suicide by doing all the right things a mother should do, and the red dragon was the externalized image of an emotion she couldn’t verbally express. By drawing it repeatedly, she slowly released the rage and was able to verbally acknowledge it. In the very last mandala Avila drew, the dragon changes from red to green. “Art therapy has a lot to do with metaphors,” Avila says. She points out that red and green are opposite each other on the color wheel: While red represents anger, green represents growth, renewal and spring. To Avila, the green dragon symbolizes the point when she accepted that life isn’t quid pro quo, but rather complex and unpredictable, full of joy and full of pain. Nash says she’s had her own bouts of unexpected understanding through art therapy as well. While drawing a series of quirky caricatures, an image of an American Indian with a clenched fist suddenly appeared. Nash pauses to consider how that sounds.